Netherby Guest House is a small yet adequate guest house just 6 minutes drive from Edinburgh Airport. 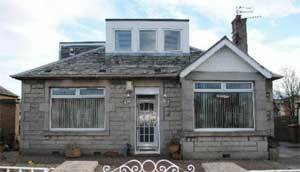 Situated in the exclusive Corstorphine district close to Gyle Shopping Centre. This detached family bungalow has a small but solid range of rooms including family, twin, double and single, with prices anywhere between £38.00 per person per night to £99.00 a room for a family (including full cooked breakfast). All rooms are en-suite and feature walk-in showers, multi-channel television, Free Wi - Fi high speed internet connection, refreshment tray plus fresh clean towels and complimentary toiletries. All rooms have a seperate entrance with 24 / 7 access. You will find the guest house located in the quiet Corstorphine district, just minutes away from Edinburgh Airport. The city centre is just 10 minutes away a with buses stopping virtually outside the door every few minutes. Other perks include a Direct Airlink Shuttle service (every 10 minutes), free private car park, and easy access to M8, M9, M90 and the Forth road bridge.